Soft plump buns – 230 calories + Mighty meat patty – 450 calories + torrential toppings – 85 to 100 calories = 765 calories to 780 calories… This is what you will be consuming while helping yourself to an average serving of your favorite burger. And don’t forget this burger is surely to be accompanied with fries and carbonated beverages to add to its glory. Top it up with consuming this combo for 7 straight days in a week and you will be all set to walk down the path of jiggling belly, triple chins and loveless love handles besides embracing severe health issues like blood sugar and cholesterol problems, heart ailments, obesity and many more. It is true that that the lust for burgers is something that cannot cease with ease. 1) Alter the buns – To begin with, say ‘no’ to refined flour and opt for buns made of whole wheat and grains. This way, you could subtract almost 120 calories from the load. At the same time, you win on fibers for promoting the health of your GI system as well. 2) Go easy with the patty – A 6 to 8 ounce slab of beef, fried in grease and tampered for taste can add anywhere from 450 to 500 calories to the burger or more. 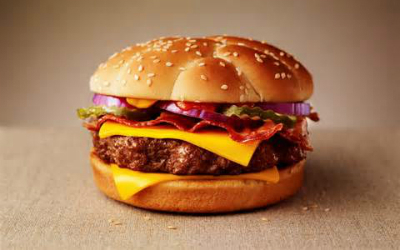 Substitution of red meat with lean meat is sure to subtract around 200 calories from the patty. At the same time, if you cut down on the size of the latter to 3 or 4 ounces you can celebrate an immediate reduction of 250 calories or more at a shot. Using healthy options of oil also contributes to calorie restriction. 3) Top with considerate toppings – Cheese, mayonnaise, ketchup and mustard can be substituted with healthier dips like guacamole. This simple alteration can scratch out almost half the calories contributed by the usual toppings. 4) Follow smart eating techniques – This is something that all lard loving weight watchers should keep an eye open for. Say for example, your favorite joint is not into offering diet buns; you could try and scoop out the innards of the burger bun presented to make a happy cavity. This not only focuses your taste buds to the patty but, cuts the calories as well. 5) Last but never the least CONTROL! Keep specific days of the week for burgers and other excesses as such, while leaving the rest of the week to give health a chance. Say for example you set aside all Monday evenings for juicy filling burgers to cut the Monday blues. The next one can be eaten on a happy Friday night because… TGIF! Healthy bun – 120 calories + considerate patty – 220 calories + thoughtful toppings – 50 calories = 390 calories… and there you are with a healthier burger 390 calories short of the usual loaded ones just by making small alterations.